It’s been a minute since I’ve shared a recipe with you. For over the past month it’s just been heads down in all kinds of work, at the day job and after hours on other projects with big due dates. I was past exhausted and tired, working at most hours of day and something had to give. And that unfortunately was the blog. Though I wasn’t pushing myself even more to keep the blog going at any cost (which other bloggers are increasingly starting to let go and take breaks when they need to), the one thing that I refused to let budge was my own healthy eating. In years past, that was one of the first things on the list to go, replaced by faster, more convenient food that I paid the price for later. Even if I was deep in work, I stopped to make meals (some of which did get simpler, but not unhealthy) and have even just a moment to myself to not work and just be. And in it’s own way, it helped get me through. Even though I had to say no to a few things or put some on the back burner, I was still saying yes to taking care of myself and eating healthy, wholesome food. Before the crazy time came, I had just had tahini for the first or second time and really started to like it, thanks to a fabulous recipe from my friend Beth and the large jar of tahini I had left over. N also really caught on to tahini, and I’ve been finding ways to put it on everything and anything I can. Tahini, for those newbies like me, is a nut butter made from sesame seeds. It’s got a more savory and tangy taste than your usual nut butters, and works wonderfully in savory applications (also in some sweet, which I have yet to try). So far, tahini is my go-to for any and all kinds of dips and dressings. Tahini’s also a popular ingredient in hummus. When searching for something to make for dinner, a pin of tahini and roasted cauliflower caught my eye and this salad started to form in my head. Instead of cauliflower, I went with one of my favorite seasonal edible fractals (and new Star Wars movie vegetable of far, far away galaxies) romanesco and added in more vegetables to round the salad out and because I’m a fan of adding as many vegetables as possible. If you can’t find romanesco in your markets, swapping it out for cauliflower will still taste great. I decided to keep the kale in this salad raw for some added crunch and texture opposite of the fork tender roasted vegetables, but you can also sauté the kale down and still have a fabulous salad. Depending on how big the romanesco or cauliflower is, you can use this as a main dish or a side. If you have a bigger one, you can also have plenty of leftovers, especially if you cook for a small table like me. And in busy times, easily accessible healthy food is a plus. If you want to mix it up when it’s leftovers, top with an fried egg or some other protein. The runny yolk of a fried egg mixes wonderfully with the tang of the tahini dressing. Whether you’re in a busy time or not, eating healthy is a great promise to make to yourself and your health. It’s good to be back. On a foil lined baking sheet, arrange carrots on one side of pan and if possible (depending on the size of your baking sheet), romanesco on the other. Lightly drizzle both with olive oil. For romanesco, lightly sprinkle with salt and pepper, and for carrots, lightly sprinkle with salt, pepper, and za'atar (you can't really overdo it with the za'atar unless the carrots are coated. Also check if your za'atar has salt in it, if so, cut down on the salt you sprinkle on the carrots). Roast both for 15-25 minutes, until fork tender. The carrots, depending on their size, may need to be roasted a little longer. 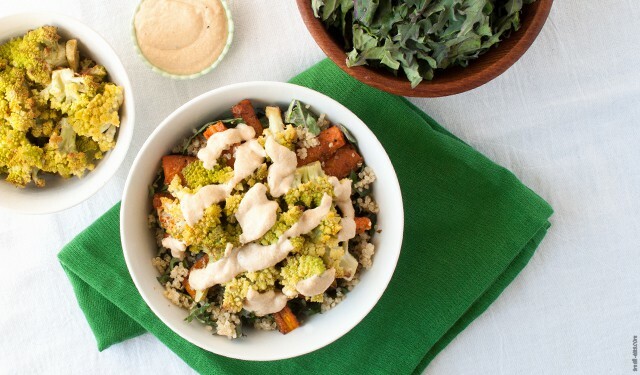 While the vegetables are roasting, combine tahini, lemon juice, and spices into bowl. Stir until lemon juice in mixed into the tahini, and add one tbsp of water at a time to the dressing to get a thinner, more dressing-like consistency. Depending on your taste, you could add more than 4 tbsp of water. Adjust seasonings to taste. 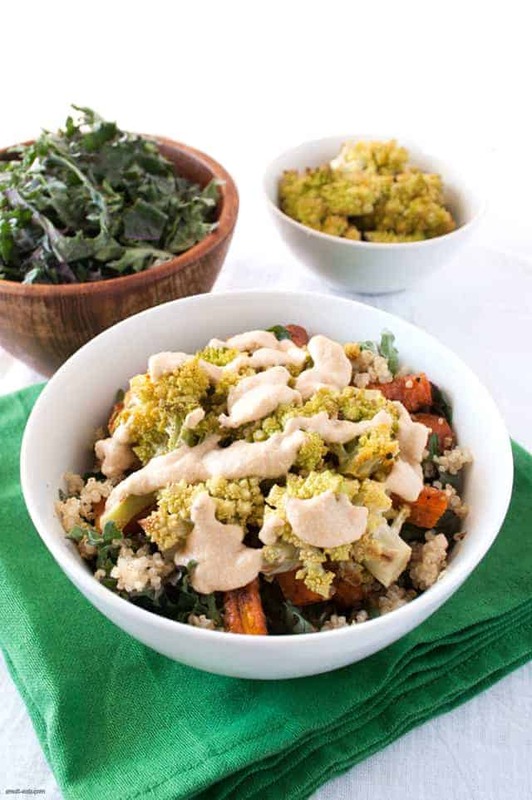 In a large mixing bowl, add the cooked quinoa and raw kale and stir to combine. Once vegetables are done, add to the mixing bowl as well. Taste and add any salt or pepper (or a dash of za'atar) as needed. Portion into bowls, then top with dressing and enjoy. Store dressing separately from salad.